ABC Reprographics takes advantage of the power of visual signs. We produce one and/or two-sided full color yard signs in Denver, complete with stakes for outdoor placement. In addition, we offer banner printing in Denver with varying sizes of custom banners for large and small businesses. They come complete with hemming and grommets, including pole banners. Full color posters including mounting and lamination are also available. All signs and banners will be delivered directly to you by the agreed-upon date, and they are sure to catch the attention of your target audience. 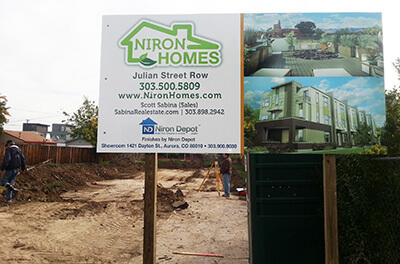 The custom banners and outdoor yard signs for Denver businesses we create are durable and weather-treated for protection against some of the harshest elements, ensuring they will stay in place longer than ones made with lesser-quality materials. Events for which you might need custom banners and yard signs in Denver can include parades, business grand openings and special corporate events. We also provide print posters Denver trade show managers need to create spectacular expo center displays. Call us today and let us help you design the perfect sign to promote your brand. We will coordinate all your print posters for placement in Denver, and these can match all of your outdoor signs.